Oliver tried to focus on the geography of Peru, but kept thinking about well-hit doubles, strikeouts and close plays. Mrs. Franzen's voice filtered into his brain during a 5-4-3 double play, "Oliver, Oliver. Mr. Winslow!" Oliver slowly realized it was not the play by play announcer calling his name, "Um, huh, yes? I'm sorry." "Thank you for joining us. Tell us about the Nazca lines in Peru." "They are, glyphs, drawings on the ground you can only see well from the air that no one understands." "Excellent. Who discovered the glyphs?" Her voice faded into the cheering crowd after Oliver hit a homer, winning the championship. At dinner, Oliver's mom said, "My car broke down today. I can't drive you to your game tomorrow. I'm sorry, you'll have to miss it." Oliver choked on his milk. "But Mom, it's the first game of the season. The team is counting on me. I'm the starting shortstop." "It's just a game." she said as she served the peas. Oliver looked at his mom as she put a slice of meatloaf on his plate. "Maybe I could take the bus. The #82 runs up Meridian to Green Lake. If you give me some change, I can?" "Now hold it right there, I have not given you permission to take the bus by yourself." "No! I'm sorry about the game, Oliver. It can't be helped." Oliver had a hard time sleeping that night. He dreamt about baseball, striking out or dropping a line drive or missing a deep fly ball. His team kept losing, and it was all his fault. He woke up early, tired, but excited. "Ok, I know what I need to do." He went straight to his coin bank, and found four dollars and seventy-six cents. "I've got just enough money for bus fare both ways." He smiled to himself. He checked the bus schedule. "Let's see, where is the ball field?" he ran his finger up the route until he found it. He looked at his clock. "Just enough time to get ready." Oliver dressed in his uniform, grabbed his money and his glove. Then he slipped down the stairs, careful not to wake his mom. "Ok, all set, here we go." Oliver let himself out the back door. Once on the bus, his mind filled with fantastic catches and hits. Oliver looked up to see the bus driver standing next to his seat. "We're at the end of the run, you gotta get off." Oliver looked around. "Where are we? I wanted to go to the ball fields at Green Lake." Oliver felt sick to his stomach. The bus driver chuckled. "You must have been daydreaming. We passed by there a half-hour ago." "How can I get back? It's too far to walk." "Relax kid, there's another bus stop across the street where you can catch a bus back to Green Lake. I'll give you a transfer so you can ride it. I played some little league when I was a kid, I know how important the games are." The driver smiled. Oliver thanked the driver, crossed the street and waited for the next bus. This time he asked the driver to let him know when they got to Green Lake, so he could get off at the right place. Oliver thanked the driver, got off the bus and ran to the field where his team played. The game had already started, so Oliver put his stuff with the rest of the team's things and went into the dugout. "Hey coach! I made it, uh, oh." He saw his mom and coach Bradley standing with their arms crossed, looking at him. Oliver attempted a sheepish grin. "Oliver, where have you been, and how did you get here?" his mom asked. Oliver stared at his shoe laces. His mom uncrossed her arms, walked over to him and put her hand on his shoulder. "You took the bus, didn't you?" Oliver's face reddened. "Yes, Mom. I just wanted to play so bad." "I understand. However, after you went to your room last night, I called your coach. He offered to give us a ride. But, you left this morning before I could tell you." Oliver looked up and caught a glimpse of the coach heading out to the field. He then looked at his mom. "I'm sorry." "I know you just wanted to play baseball. I wanted you to play, too. Look, I'll promise to make sure you get to every game if you promise to stay off the bus. Deal?" "Mrs. Winslow," coach called from the end of the dugout. "Could you umpire the game? We're one umpire short today." Oliver's eyes widened. "You're gonna umpire? I didn't know you knew anything about baseball." His mom smiled. "I forgot to tell you? I lettered in softball in college. Come on son, let's PLAY BALL!" There is a moral to this inspirational baseball story. Go after your dreams, but make sure mom knows where those dreams will take you! 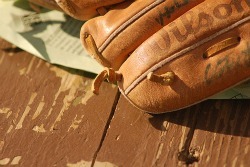 Image of glove by Sean Winters. I really like the baseball details.